The Newfoundland Railway was not merely a convenient route to the middle of nowhere. Rather it made two vital connections. The initial public face of the railway was always that it connected the population centres of eastern Newfoundland to a hinterland -- to "open up" the west, very much in the model of other North American railways. The second link was clearly one between Newfoundland and Canada. From the first there was an association between the Newfoundland Railway and Confederation with Canada. On the one hand, the railway was first proposed after confederation had been soundly rejected, in 1869, and was seen by some as a necessary exertion of Newfoundland independence: "the work of a country." On the other hand, the "people's road" was also an attempt to "North Americanize" Newfoundland, to develop a land-based economy. The railway's strongest advocate, William V. Whiteway, had been an avowed confederate in '69. The Canadian connections of the Reid family provided further ammunition for those who cast the railway as a stalking-horse for confederation. While the association may not have been as sinister as was sometimes played out in the partisan press of the day, it is true that the Reid family several times took the lead in exploratory talks aimed at confederation. 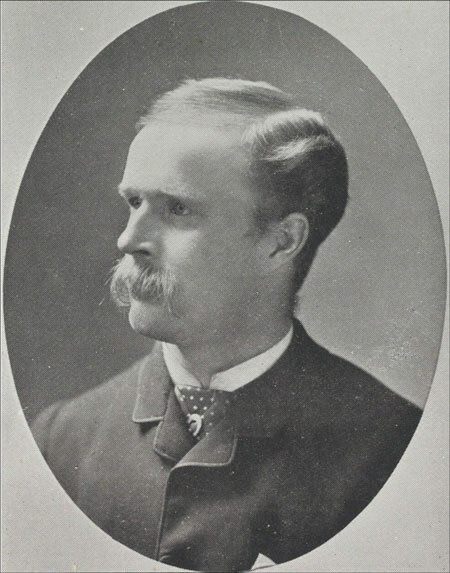 Confederate trial balloons had been floated by Robert G. Reid in response to the bank crash and fiscal crisis of 1894. William Reid's machinations at the time of the railway contract of '98 and through the early 1900s were expressed as political support of an avowed local confederate, Alfred B. Morine. William again attempted to encourage confederation during World War I. He hoped that the line might be nationalized and absorbed by Canadian National Railways, relieving the Reids of their commitment to a money-losing operation. A similar hope was entertained by elements in the Commission of Government after 1934. Alfred B. Morine (1857-1944), n.d. In the late 1890s Morine, Newfoundland's Finance Minister, supported confederation. Photographer unknown. From Henry Youmans Mott Newfoundland Men (Concord, NH: T.W. & J.F. Cragg, 1894) 21. Print. As confederation was seriously debated in the National Convention and referendum campaigns of 1946-48, the families of 5,000 employees of the Newfoundland Railway were seen as a natural constituency favouring confederation. The railwaymen were felt to be more "North American" in their outlook, attitudes and expectations than the inhabitants of remote fishing villages. Many of the railwaymen were members of international unions, with direct knowledge of higher Canadian wage scales. The confederates also argued forcefully that confederation would make the railway prosper by virtue of increased traffic from Canada. Under terms 31-33 of the Terms of Union (1948) the Newfoundland Railway, its services, personnel and property were assumed by the federal government. The immediate changes included wage increases and adjustment to the standards of Canadian National Railways (C.N.). 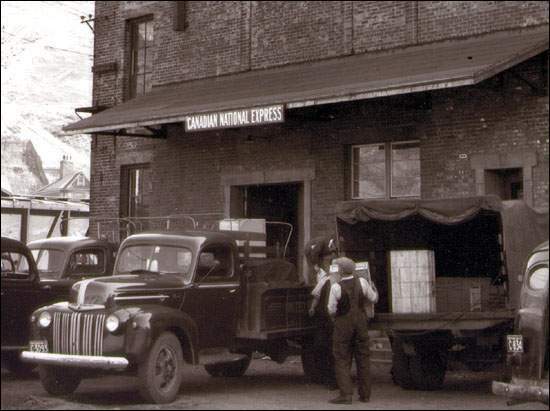 The line had once again been run down in the name of the war effort, requiring major improvements to cope with the increased freight which did indeed accompany a post-confederation boom in construction, and an increased demand for North American consumer goods. Cold storage depot at the St. John's Riverhead Station, newly taken over by Canadian National Express. In the first decade after confederation C.N. made considerable expenditures in Newfoundland: revamping the Port aux Basques terminal, ordering new ferries (including the first rail- and passenger-ferry, the William Carson in 1955), upgrading yard facilities at Corner Brook and St. John's, introducing treated ties and 85-lb rail, raising the track through the Gaff Topsail by four feet, and replacing steam locomotives with diesel-electric (1953-59). Yet annual operating losses continued, and the old Newfoundland Railway hands complained that C.N. junior management was addicted to cheese-paring. Protected to a degree by its inclusion in the Terms of Union, the railway was supported as a public work and even as a legacy of Newfoundland's former independence. The completion of the Trans-Canada Highway across the island in 1965 began a downward spiral whereby the Railway lost traffic, lost money and lost support at the management level, losing consumer appeal and traffic. In 1968 C.N. 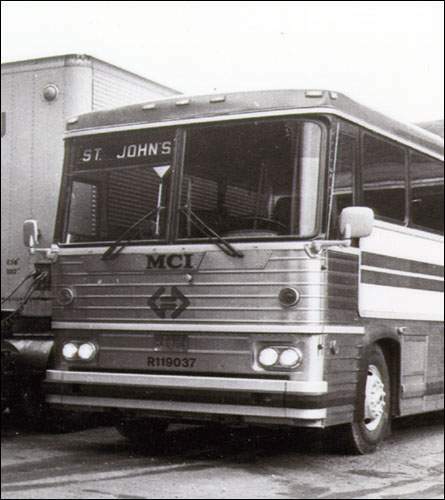 introduced a trans-insular "Roadcruiser" bus service, and the following summer express passenger service was discontinued, the last run being 2 July 1969. Increasingly it was felt that the writing was on the wall for the freight service as well, as all but low-value bulk cargoes were soon being carried by container trucks (although the railway did compete successfully for container traffic for a time). A Royal Commission into Newfoundland's Transportation System, chaired by Dr. Arthur Sullivan, recommended in 1978 that the railway be phased out. There was public outcry, and the Newfoundland Railway was removed from C.N. 's Atlantic Division headquartered in Moncton, and placed in a separate division: TerraTransport. But five years later it was clear that the railway was nearing the end. C.N. "Roadcruiser" bus bearing the TerraTransport logo. The Bonavista and Carbonear branches were closed in 1983, and Argentia followed the following year, along with 32 stations on the main line. Even the greatest supporters of the railway had to admit it was only a matter of time: the trains ran only rarely, rail transport was scarcely considered in consumer and corporate choices, and the grass literally grew between the tracks. Support for the railway by the provincial government was largely a matter of posturing, to get the best deal possible before letting the federal government off the hook. On 20 June 1988 it was announced that the federal and provincial governments had struck a deal for the final closure of the railway. The federal government agreed to provide $800 million in long-term highways upgrading. The last train ran on 20 September 1988, and by the end of 1990 all the track had been taken up. 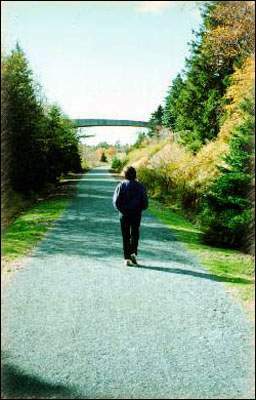 The Newfoundland Railway trackbed has since seen much use of both commercial and recreational purposes, and has been the focus of efforts to preserve the old line for the people of the province as a "T'railway." The Newfoundland T'Railway section of the Grand Concourse begins at the heritage train station on Water Street, and continues west through St. John's, Mount Pearl and Paradise. Photo courtesy of the Newfoundland T'Railway Council, ©2000. In 1997 it was announced that the T'railway would form a linear provincial park, and it has since also been co-opted into the Trans-Canada Trail.